Fourth Row Center: Film Writings by Jason Bailey: On DVD: "The Rebirth of Cool: U2 in the Third Millennium"
On DVD: "The Rebirth of Cool: U2 in the Third Millennium"
When U2’s 1997 album Pop met with weak sales and indifferent critical response, many rock fans and journalists figured that the band was down for the count. They’d had a good run of it, dominating mainstream pop music for a full decade, but their attempt to marry their traditional rock sound and the edgier, alt-rock sound of their last two records with an outright club/electronica groove for Pop resulted in an album that pleased few—it was too experimental for the rock purists, too traditional for the club kids. But somehow, by returning to the sound that put them on top, the band become one of the most commercially and critically successful artists of the following decade. The documentary disc The Rebirth of Cool: U2 in the Third Millennium tracks, with surprising insight and detail, exactly how that happened. I use the word “surprising” because The Rebirth of Cool is another in the not-quite-distinguished subgenre of unauthorized music biography DVDs, which are usually notable for their shallow observations, interviews with passing associates and hangers-on, and lack of music by the artist in question. The Beatles and Bob Dylan are the most frequent targets, but U2 gets its fair share as well; in fact, this is my second unauthorized U2 doc in as many months. The refreshing news about this particular title is that it not only includes healthy doses of the band’s music (via both music videos and live performance clips), but genuinely thoughtful analysis by a distinguished group of (mostly British) music journalists and cultural critics. For example, though I’m a diehard U2 fan, I’d never really considered how the release of the Best of 1980-1990 album, and its reworking of the Joshua Tree B-side “The Sweetest Thing,” possibly played into their decision to move back towards their earlier sound for their next major project. Nor had it occurred to me that their two songs for Bono’s ill-fated side project The Million Dollar Hotel are, in retrospect, a clear indicator of the sound they were moving towards. But when these notions are put forth by the music journalists here, they totally click; the line to All That You Can’t Leave Behind becomes crystal clear. The film’s contributors also tackle the singles from that album and its follow-up, How to Dismantle an Atomic Bomb, on a thorough, almost case-by-case basis, and their impressions are enlightening and often right on the money; one notes that “Beautiful Day” is “almost giddy with the excitement of being a new U2 record,” while another takes notice of its interesting interpolation of a-ha’s “The Sun Always Shines on TV.” And not all of the commentary is rosy—there is a fascinating discussion of the real-world effectiveness of Bono and the band’s charity work (this under-five minute section is more thought-provoking than the entirety of U2: A Rock Crusade, which was focused solely on their philanthropic efforts). The narration is a little over-cooked, but it does have some good background info; particularly interesting are the notes on the real people and events that inspired certain songs, the contrasting sounds brought to the albums by producers Brian Eno, Daniel Lanois, and Steve Lillywhite, and the specific manner in which the band became part of the American soundtrack in the aftermath of 9/11. The Rebirth of Cool: U2 in the Third Millennium has its problems; as is expected, its lack of input from the band (they’re only heard from in a few brief archival interviews) leaves it wanting for inside information (the closest they get is an engineer), and, at 68 minutes, it’s just a touch too long for the material being covered. There’s also a crucial timing issue—the disc, with its many mentions of the band’s two albums of the decade, has been beat to American retailers by U2’s third album of the millennium, No Line on the Horizon, which is only alluded to as being “in production and soon to be released.” Oops. Still, for the period it covers and the limited access its makers had, The Rebirth of Cool does its job quite well. Unauthorized music bio discs are a notorious waste of time and money, but The Rebirth of Cool: U2 in the Third Millennium is surprisingly informative and well-made; to paraphrase Jack Nicholson in The Two Jakes, it’s the leper with the most fingers. Non-fans won’t give it a second glance, of course, but music historians and U2 buffs should definitely consider picking it up. 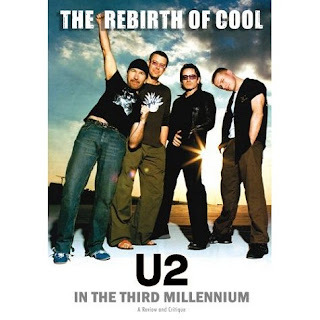 "The Rebirth of Cool: U2 in the Third Millennium" is currently available on DVD.